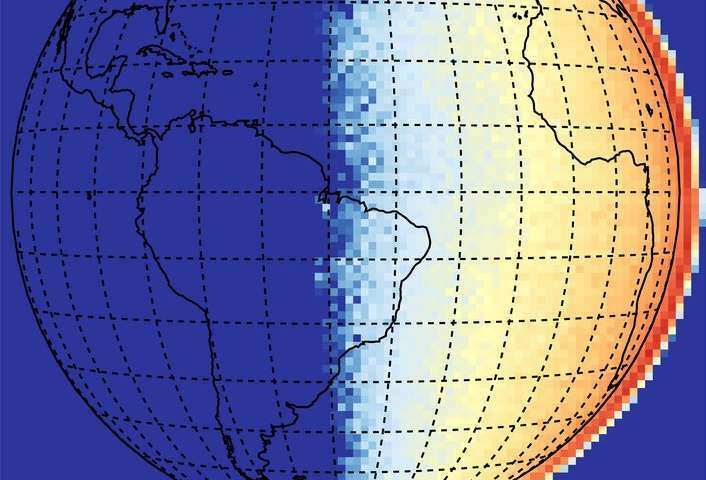 NASA's Global-scale Observations of the Limb and Disk (GOLD) instrument powered on and opened its cover to scan the Earth for the first time, resulting in a "first light" image of the Western Hemisphere in the ultraviolet. GOLD will provide unprecedented global-scale imaging of the temperature and composition at the dynamic boundary between Earth's atmosphere and space. Team scientists conducted one day of observations on Sept. 11, during instrument checkout, enabling them to produce GOLD's "first light" image shown here. Commissioning will run through early October, as the team continues to prepare the instrument for its planned two-year science mission. Built by LASP, and managed by NASA's Goddard Space Flight Center in Greenbelt, Maryland, GOLD is the first NASA science mission to fly an instrument as a hosted payload on a commercial satellite. Data from the instrument—comprised of two, identical ultraviolet-imaging spectrographs—will improve our understanding of the Sun's impact on the Earth's upper atmosphere, as well as the effects from terrestrial weather below. "GOLD is an amazing technological breakthrough," said GOLD Principal Investigator Richard Eastes, a research scientist at LASP. "After years of reviews, testing, testing, and more testing, the instrument is finally making observations of the Earth. The main act has begun. It's a testament to the engineering and science teams, who were responsible for building and calibrating the instrument, that we've reached this significant mission milestone." Along with NASA's Ionospheric Connection Explorer (ICON), scheduled for launch later this fall, GOLD is a key element of NASA's program to explore Earth's boundary with space, as the two missions explore this unpredictable near-Earth region to determine how it responds to solar and atmospheric inputs. "The successful launch of GOLD and acquisition of initial data is a fantastic result," said Bill McClintock, GOLD instrument scientist at LASP. "Its data will help us understand the critical role the Sun plays in space weather and allow us to better protect astronauts and our technological assets that we've become so reliant upon in today's society."